Promoting a new wine into the market is already difficult when competition is so intense. Promoting a scarcely known wine region or country could be even more difficult. From among the popular marketing methods is exhibition with seminar and tasting booths and it was the method that the Wines Of Turkey Organization adopted. 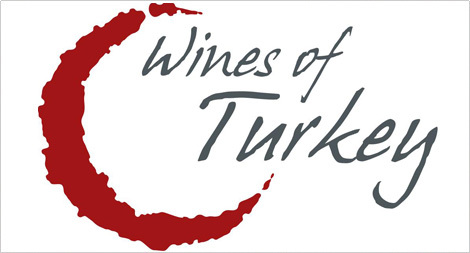 Mr. Taner Ogutoglu (Director of Wines Of Turkey Organization) led the Organization's first Pavilion of 10 wineries at the Hong Kong Wines and Spirits 2013 in November. 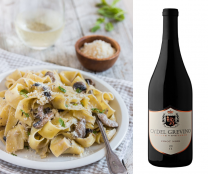 Their main objective was to introduce Turkey to opinion leaders and importers in Hong Kong as a wine producing country that have both Old World and New World characteristics. To understand Turkey as a wine producing country, a glimpse on its history, location, climate, grape varieties and vinification is crucial. Turkey is classified as an Old World wine country when viticulture and winemaking history in Turkey started as early as 7,000 B.C. and Turkey could have been one of the earliest wine producing regions of the world. However, owing to political instability, cultural and religious obstacles, government ban, wine production development in Turkey was at a snail's pace. When other European countries were heavily involved in rebuilding the wine industry and experienced speedy and steady growth after the World Wars, wine production in Turkey was still in sleeping mode. Not until 1980s could Turkey's wine production start development again when the newly elected government adopted open economy policy and lifted the ban. There are around 150 wineries in Turkey today, most of them are not in large scale and similar to the wineries in the New World, all employed latest viticultural and modern vinification techniques and facilities. 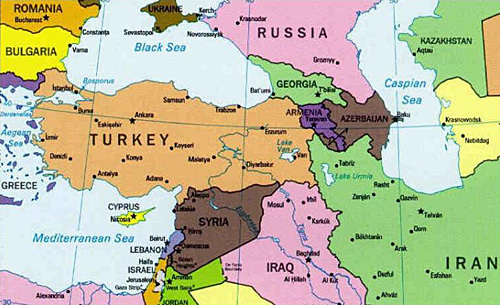 Turkey is a transcontinental Eurasian country that lies between latitudes 35 and 43N. The country is more than 1,600km long and 800km wide, forming a roughly rectangular shape and is encircled by seas on three sides: the Aegean Sea to the west, the Black Sea to the north and the Mediterranean to the south. Varied landscape brings along varied climates and environmental conditions. Terrior oriented wine producing regions are unavoidably scattered. In the North West, there is the Marmara region with lime to gravelly loamy soil that accounts for 13.6% wine production. It borders Black Sea, Marmara Sea and Aegean Sea with Mediterranean climate (hot summers and mild winters with an average of 550mm rainfall per annum) though the humid maritime influence along the coast might curtail production. In the West is the important Aegean region which accounts for 52.7% of total production. Its soil profile ranges from clay loam to calcarious chalks. It faces Aegean Sea and Greek islands, has basically Mediterranean climate with some maritime influence and has an annual average rainfall of 550m. Coastal vineyards are at an altitude of 150m and continental climate becomes more prominent when vineyards elevate to as high as 900m inland. The Mid-Southern Anatholia wine region is in Central Turkey and contributes 12.1% to the total production volume. It is landlocked with poor decomposed, tuffa volcanic soil, and has typical continental climate (hot dry summers and cold winters). Adding to an annual 500mm precipitation and large diurnal temperature range, this region offers ideal growing conditions for vine cultivation. Another 14.7% production comes from Mid-Eastern Anatolia region in East Turkey. The area is more rugged and mountainous with natural and artificial lakes and have terrestrial climate with cold wet winter and hot dry summer. Soil profile ranges from glaciated alluvial to red clay, decomposed granites and light chalky clay. Precipitation differs between 600–1000mm across the region. 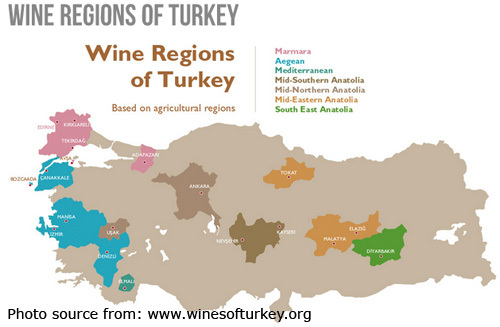 The 4 major wine production regions with their own unique climate and environmental conditions listed above are home to a variety of grapes in Turkey. Turkey has more than 1000 indigenous grape varieties and a range of international grape varieties are in production. Currently, there are 30 grape varieties that are widely used for wine making. According to Mr. Taner (Director of Wines Of Turkey Organization), Turkey will focus on the promotion of wines from the five indigenous grapes (White: Emir and Narince; Red: Kalecik Karasi, Okuzgozu, Bogazkere) as well as certain international varieties (White: Sauvignon Blanc, Chardonnay; Red: Merlot, Cabernet Sauvignon, Shiraz). Below is the chart that summarize the location and volume of the major grape varieties for wine making in Turkey. Wines are made in both varietal or blend. Vinification in Turkey is in New World style with international standards imposed. There is no machine harvest and all grapes are hand-picked mostly at night where picking time hinges on serious individual decision based on sugar and ripeness level of the grapes. French barriques are widely used for fermentation and aging. Wine makers and consultants in wineries come from Italy, France, California and Australia. Unfortunately, Turkey does not have Encology in Universities and potential winemakers are therefore motivated to study overseas in Germany, France or US. Relatively speaking, Turkish government is not supportive to the wine industry. There is no appellation system and no legal regulations on viticulture or vinification. There is as well no exemption or encouragement of any kind to the wineries in terms of taxation. However, there is a fixed tax rate of 1.5 Euro per litre on domestic wine consumption and bag-in-box packing is restricted. Both acts discouraged bulk wine production. Mr. Taner stated clearly that Turkey would like to position himself in selling high quality fine wines only as Turkey's production is not big as compared to the "giant" wine-producing countries such as Italy, Chile, Argentina and California. Current production is 75 million litres per year with merely 3% for export. 50% of domestic consumption comes from Tourism and only 10% of population drink wine. Notwithstanding limited support from the government, the Turkish wineries glamour still, probably the outcome of strict self control, hard work, skills and enthusiasm of the winemakers. Between 2011 to 2013, 78% of Turkish wines sent out to prominent international competitions (IWC 2012, IWSC 2012 and Decanter 2012) won medal rating of either double gold or regional trophies. Some winemakers are the Rising Stars in the winemaking world and to name a few are Ahu Cmli Tokgoz and Sanem Karadeniz from Kavaklidere winery, Ozge Kaymaz from Kayra winery and Sibel Coban from Svilen winery. In 2013, the main markets for export are Germany and UK. Hong Kong and China are the new dimension and the price points set for export will range from minimum Euro 3 to over Euro 20. According to Mr. Taner, their wines will aim for a medium price range at retail. 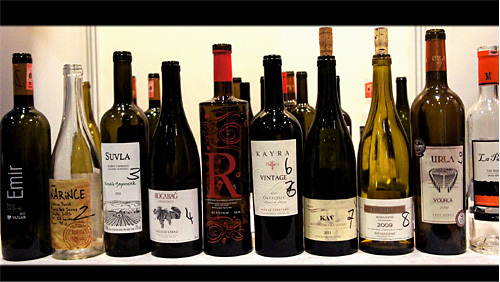 Concludingly, Turkish wines have all the potential conditions for high quality fine wines–appropriate climate and soil in general, updated and well applied techniques and skills and most important of all, the will to eiliminate bulk production. Yet, I shall highly recommend a thorough study into Turkish wines and Chinese food matching is essential before the wines are to be launched in Hong Kong and China where wines are normally served with food rather than enjoying on its own here. The white wines I tasted got citrus and spicy notes, with medium acidity and were full bodied while the red wines had black fruits and mineral notes with high tannin and were full bodied with noticeable alcohol level. These wines could be difficult to match Chinese food. However, with a wide spectrum of Turkish wines (more than 500 wines), no doubt that a beautiful wine and food match can be achieved and I shall look forward to the wines in coming future.